For the history of New Zealand provincial competition before 2006, see National Provincial Championship. The 2007 season saw the NZRU dumping the pool system. The new format opened with a 10 week round-robin where each team missed out on playing three of the other teams. The finals format was not changed from 2006, with the quarter-finals, semi-finals and a grand final. The champion was Auckland, defeating Wellington in Wellington's second successive grand final. Auckland finished the season at the top of the points table with a record 48 competition points, winning all ten matches. Jimmy Gopperth again finished as leading points scorer with a record 155, while Brent Ward from Auckland was the top try scorer with eight tries. Changes in 2011 see the 14 teams split into two divisions, with the top seven playing in the Premiership, the rest in the Championship. The two divisions play each other, though their ten-game round-robin season sees each team playing only three games per year against teams in the 'other' division. Other key principles introduced was that the competitions must include Super Rugby players, have a stand-alone window, feature a full round-robin and playoffs, have promotion/relegation, guarantee four and five home games per team, be completed within a 10–12 week window and conclude by the end of October. Since 2011 teams have played in two separate divisions, with teams playing each team in their own conference once (home and away) and in the other conferences playing four or five teams. The winner of the Premiership division is awarded the ITM Cup, and the Championship division winner wins promotion to the Premiership division and win their division trophy. The Air New Zealand Cup was unveiled by New Zealand Rugby Union Deputy Chief Executive Steve Tew and Air New Zealand Chief Executive Rob Fyfe at the official launch of the Air New Zealand Cup competition in Auckland. The trophy stands 45 cm tall and weighs 3.9 kilograms. It was hand forged from 2.7 kilograms of sterling silver by master silversmith Thorkild Hansen. The inside of the cup is gilded with gold. Waihi stone carver Jeff Beckwith handcrafted the polished stone base from black basalt quarried from the Bombay Hills. 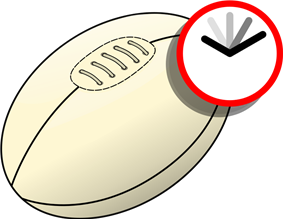 The Ranfurly Shield, colloquially known as the Log o' Wood, is perhaps the most prestigious trophy in New Zealand's domestic rugby union competition. First presented to Auckland in 1902, the Shield is based on a challenge system, rather than a league or knockout competition as with most football trophies. The holding union must defend the Shield in challenge matches, and a successful challenger becomes the new holder of the Shield. The Shield holder at the end of each season is required to accept at least seven challenges for the following year. All home games during league play, but not during knockout playoffs, in the ITM Cup or Heartland Championship are automatic challenges. The remaining Shield defences must be made up of challenges from unions in the other domestic competition. For example, since North Harbour, an Air New Zealand Cup team, held the Shield at the end of the 2006 Cup season despite losing their home quarter-final to Otago, they were forced to defend the Shield against Heartland Championship teams during the 2007 pre-season. Having successfully done so, all their home fixtures in the round-robin phase were Shield defences until they lost the shield to Waikato. The Shield is currently held by Counties Manukau, who won it from Hawke's Bay in the 2013 ITM Cup.